Through 2022, the nonresidential market is projected to be the faster growing, bolstered by a robust expansion in the construction of nonresidential roofing demand in the Asia/Pacific region. However, the residential roofing market will remain considerably larger, supported by increases in both new and reroofing demand in most parts of the world. Developing countries in the Asia/Pacific and Africa/Mideast regions will be the fastest growing through 2022. China and India together will account for nearly half of the world’s demand growth for roofing products in absolute terms. Expanding business activity and nonresidential construction will be the main drivers of demand in both countries. Low-slope bituminous, metal, concrete tile, and clay tile, combined, will account for 62% of the increase in roofing demand through 2022 in area terms. Market advances for low-slope bituminous and metal roofing products will be fueled by the healthy gains anticipated in the nonresidential market, where these products are commonly used. Demand for clay and concrete tile products is also expected to rise, bolstered by increasing improvement and repair and new residential building spending in the Asia/Pacific and Africa/Mideast regions, where these products see widespread use on residential buildings. 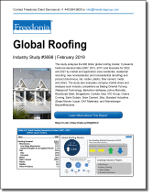 This Freedonia industry study analyzes the $92 billion global roofing market. It presents historical demand data (2007, 2012, and 2017) and forecasts for 2022 and 2027 by market and application (new residential, residential reroofing, new nonresidential, and nonresidential reroofing) and product (bituminous, tile, rubber, plastic, fiber cement, metal, and other). The study also evaluates company market share and analyzes the following key players: Beijing Oriental Yuhong Waterproof Technology, Berkshire Hathaway (Johns Manville), BlueScope Steel, Bridgestone, Carlisle, Etex, IKO Group, Owens Corning, Saint-Gobain, Siam Cement, Sika, Standard Industries (Braas Monier, Icopal, GAF Materials), and Wienerberger Baustoffindustrie.